LTHForum.com - Microwave died--can I live without it? Microwave died--can I live without it? LTH Home > Chat > Shopping & Cooking > Microwave died--can I live without it? I've assumed this question went here rather than other culinary chat. My microwave recently died--very sparky inside when turned on. Pretty scary. I have a small kitchen, and, with the microwave dead, I'm LOVING the extra counter space. I've been thinking about buying something at IKEA or Target to hold a microwave and then put a new microwave on a stand or cart made for it and put it off to one side. Trouble is that, even a small stand or cart looks dorky and blocks flow to the back stairs (which are off the back of the kitchen--think typical Chicago bungalow that a zillion people have). So the question is: can one live without a microwave? I made stove top popcorn (not Jiffy pop, the real deal) for the kids last night--which they liked a lot, so that's taken care of. (And by the way $1.30 for a bag of yellow popcorn that will probably pop up the equivalent of 15-20 bags of microwave popcorn and purchased at Dominick's of all places!) I hate the way microwaves defrost although I have used them in a pinch. The big question concerns warming. I've got pasta in tupperware in my fridge that I would have eaten by now if I still had a working microwave. Short of planning on taking it to work, are there any good non-microwave warming techniques for left-overs like pasta? And what are people's thoughts on the necessity of a microwave? Some can definitely live without it. I probably could but I won't. I don' t like some food heated up in a microwave. To heat pasta, either put it on a pot on top of the stove with a cover (you might have to add a tablespoon of water). Or wrap things well in foil and heat up in the oven. Or put things in a baking dish and heat in the oven. It will take longer. I don' t really use my all that much and could probably get by without it. One of the most all-time annoying gifts I ever got was a microwave: annoying because I specifically had asked NOT to be given one, as I had worked my life around planning ahead, which you'll need to do if you don't want one. Most culinary uses of the microwave can be replaced by a double-boiler with a steamer insert: you can reheat with a bit of steam (or in the case of pasta, as was outlined above.) Chocolate melts easily in a double boiler, although there's more cleanup. I pop popcorn in my cast iron skillet and it tastes a lot better than microwave. Other than that, I now do a lot of defrosting with my microwave- and that's a problem. The main reason I didn't appreciate the gift is that pre-microwave, I planned the next day's meal after dinner and pulled out whatever to defrost in the fridge (much better and more evenly) I bought a lot more fresh food and went through it more quickly as well. I also planned in such a way that there were no leftovers, which are harder to deal with without a microwave. I've once again grown accustomed to easy reheating (coffee at least 2-3 times before I finish the cup) and defrosting, and as a Mom I don't plan as well as I could when I was single, but I do miss the inconvenient old days. I lived without one for years. Now I have kids and it's fairly indispensable-seeming, yet I'm sure I could dispense with one with a little planning ahead and willingness to tolerate whining. So the answer is, sure you can, unless you can't. Years ago in another life, my Dad and I had an ongoing argument over whether to acquire a microwave for our Moscow apartment. I insisted I wanted a dishwasher over any microwave, which he said was not important. We never got either the microwave or the dishwasher. You can live without one, though they are convenient for reheating leftovers, drinks and melting butter. We rarely use ours - unless it's to heat a mug of water for tea or something. Then again, we don't have children that demand to be fed instantly so your mileage may very. I have been living without one for 2 months now. Mine broke and I haven't gotten around to replacing it. I will, but just haven't yet. I have found that I used to use it more often than I realized, but I haven't had difficulty living without it. I have reheated pasta in a small pot with a lid several times. I tend to put the pasta and the sauce in together or put butter in and stir frequently if I want plain buttered noodles. This week I find myself warming up Thanksgiving leftovers in a small pot or even a skillet--only slightly more time consuming really. The one time that I did find it particularly annoying was when I was short on time and had to make Chex Mix for a party. I have gotten in the habit of making Chex Mix in the microwave (works great, which I never would have believed if I hadn't watched someone do it! No taste difference compared to baking.). Usually takes 6 mins in the 'wave (stirring every 2), but an hour in the oven. Not good for a procrastinater like me! To go a little off-topic, after using a Keurig at work, I purchased one for home use b/c I like having an instant cup of coffee or tea brewed from grounds or leaves within seconds. The Keurig cup allows me to use my own coffee and tea if I desire. Using the Keurig cup allows me to be a little more "green" than using the K-cups. Of course I suppose we could live w/o - whenever we visit the in-laws in Japan, we reheat on the stove in pots or simply eat many things cold (ie: grilled fish, etc). I would never have predicted it, but I've actually come to use a toaster oven a lot more than I ever used a microwave. Worthless for defrosting, but highly superior for reheating many things (pizza, for one) and for making nachos. I also use it for very small quantities of things I might otherwise bake in the oven (french fries)--more energy efficient. It wouldn't probably do you much good, space-wise, but it would be smaller than most microwaves and then you don't need a toaster, it that's something you usually have on the counter. It really depends on what you use a microwave oven for. If all you do with it is thaw and reheat, yes, with a little planning you can do without one. I have never understood why people buy an expensive appliance and use it such paltry ways. I use mine constantly. Yes, I do all the reheating, thawing and popcorn popping* everybody does, but I also use mine for cooking. My microwave is indispensable for making bacon and vegetables. I also use it regularly for steaming fish and chicken breasts and melting butter, chocolate and cheese. There are probably more, but I use it so reflexively that I don't even think about it. It's often only in play for a portion of a dish. For example, I will sometimes partly cook potatoes in the microwave and then finish them in the toaster oven. It isn't the best tool for everything. I recently watched somebody cook a turkey in a microwave, and although it came out much better than I'd have expected, the process was so fussy that I can't imagine how anyone would find the time savings worthwhile unless they didn't have a regular oven. Yet what it does well, it does extremely well. I'm always finding new things to cook in it. 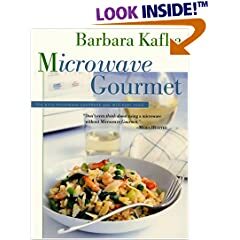 I bought Barbara Kafka's "Microwave Gourmet" when it first came out and never looked back. *You don't need to buy microwave popcorn. Regular popcorn pops fine. I only broke down and finally purchased a microwave maybe a year and a half ago, so, yes, you can get along fine without it. I even went through college without a microwave. The only reason I finally marched off to the Target to buy one is for reheating. It just seemed like a waste of time and energy reheating on the stovetop or in the oven. I've eventually come to use it for one other thing: steaming vegetables. I don't really like popcorn (not enough to buy at any situation other than a movie), so that use it out. And "expensive appliance"? It's like fifty bucks or something. If you have or are planning on having a baby, a microwave is pretty handy for sterilizing toys, bottle components, pump parts, etc. in those microwave sterilizer bags. Beats doing it all by hand on the stove top, and the convenience and time definitely trumps doing it in the dishwasher. As for food-related things, I primarily use the microwave to reheat foods and to cook bacon. I also have used it on occasion to cook a winter squash. (America's Test Kitchen had a show where they cooked acorn or butternut squash in the microwave and then finished it with a glaze in the oven. I believe Chris Kimball said that it was the first time they ever recommended doing anything in the microwave.) I may use it to defrost frozen soups or stews just to the point where I can get them into a pot on the stove, but I pretty much never defrost uncooked meats in the microwave, as the edges always end up getting cooked to some degree in the process. All of these cooking-related things could be done just fine by other methods, but I find the convenience well worth it. Of course, I have a built-in microwave that does not take up counter space. If that wasn't the case, it might be more of a difficult call. Thanks for all the suggestions. I've decided to go two months without it and see how it goes. Bacon was another thing I cooked a lot in the microwave. I've found that I like the taste of it a little better in the frying pan although it's not as predictable. As Holly suggested, a toaster-oven was a suggestion a couple of non-LTH friends I spoke to mentioned. Can't defrost, but you can reheat pizza. I'm going to wait on that too. Two months should be enough to determine whether I want either a microwave or toaster-oven. Mine was a combo microwave/range hood, which made it easier to accept having the thing in my house. One of my main uses for it isn't as a microwave at all-- I put my sourdough starter jar in it with the light on, and that's just warm enough to activate it for breadmaking. I agree, price isn't the issue, space is the issue. I'm a lot more concerned that anything I buy get enough use to justify its square footage (or be easy to store downstairs and only bring out a few times a year, as is the case with my roto-fryer). Yeah, mine is built in over the cooktop, too. No space waste, but underused as well. Bacon is great ; lay strips on double paper towels on a plate and cover with two more towels and another plate. Keeps it nice and flat, and removes a lot of the grease. Also quick. Have a Presto "Power Pop" microwave popper which does an excellent, quick job; makes great popcorn. It's about $20 and it produces fewer "old maids" than any popper I have ever tried, including hot air and stovetop. Lots of beverage heating/reheating, cook squash, preheat potatoes before finishing in the oven, stuff like that. We have Barbara Kafka's microwave book (my wife went to college with her) and actually don't use it as much as we should. Also have her roasting and soup books. Just received her latest, Vegetable Love which looks to be excellent. Mike G wrote: Mine was a combo microwave/range hood, which made it easier to accept having the thing in my house. That's the other thing I don't understand -- why so many foodies sneer at microwave ovens. It's just a tool. If you use it correctly for the things it does well, you get good results. I know, I know, real cooks don't use appliances at all. All they need is a knife, a frying pan and a supply of hardwood. But I'll be eating hot, crisp bacon while they're still building their fire. I just don't think the things it does moderately well-- melting butter or chocolate, reheating leftovers-- are cooking per se. I get a lot of use out of it, it helps in many processes, but there isn't a single dish I actually cook, start to finish, in it, partly because you can't stir or flip or any of that stuff while it's zapping something. Mike G wrote: I just don't think the things it does moderately well-- melting butter or chocolate, reheating leftovers-- are cooking per se. I get a lot of use out of it, it helps in many processes, but there isn't a single dish I actually cook, start to finish, in it, partly because you can't stir or flip or any of that stuff while it's zapping something. How many dishes do you cook that have to be started on the stovetop and then finished in an conventional oven? Do you think less of either device because of it? You can't stir or flip while things are baking in your oven or smoking in your WSM, either. Kafka has some pretty creative recipes, many of which you can find on the New York Times web site. Here's her article on steamed puddings and some fish recipes. How many dishes do you cook that have to be started on the stovetop and then finished in an conventional oven? Not many, actually. I guess the hot brown the other day was one. In any case, it's clear to me that the finishing effect of a microwave is not pleasing on almost any food, compared to the finishing effect of a fry pan, Dutch oven, broiler, etc. It has its place in many processes but I could get by without it in a way that lacking a stovetop or oven would leave me sunk. Not sure that's "thinking less of it," as opposed to just using a tool for what it's good for and not for what it's not good for. When we moved, I was mostly unwilling to devote the kitchen space to our microwave, so we have it plugged in on a shelf in our garage, just off the kitchen. We use it very rarely, mostly for occasional reheating, but I really don't miss it. We do have a toaster oven, and I've found that or a covered pot reheats things much more to my liking. Even when the microwave was easily accessible, it was never quite as easy as promised to reheat things. I'd throw a plate in for a couple minutes. Take it out, stir. Put it back, repeat another time or two, until I'm working in 15 or 20 second increments. Heating is uneven, and often I'd give up and just settle for mostly warmed food. LAZ makes interesting points about really learning how to make the best use of a microwave, which I've certainly not done, or even really thought of. I don't really know anyone who doesn't use it mostly for reheating or defrosting. I think your two month trial is a good idea. I must admit I do miss it for bacon--although yesterday I made a recipe for pasta sauce that called for the onion, garlic, pancetta and tomato to be cooked in a tablespoon of bacon drippings, so I saved the morning's bacon drippings for dinner. I think the bacon tastes better out of the frying pan but sometimes a corner or edge will get burned. This didn't usually happen when I microwaved. The perfect look of microwave bacon can be a little Stepford Wiveish though, which was creepy. I'm still in love with the extra countertop space and also just the look of the kitchen without a big box occupying so much visual space. CCCB wrote: Thanks for all the suggestions. I've decided to go two months without it and see how it goes. Bacon was another thing I cooked a lot in the microwave. I've found that I like the taste of it a little better in the frying pan although it's not as predictable. As Holly suggested, a toaster-oven was a suggestion a couple of non-LTH friends I spoke to mentioned. Can't defrost, but you can reheat pizza. I'm going to wait on that too. Two months should be enough to determine whether I want either a microwave or toaster-oven. If you stole my microwave, I would hurt you. But, if you even glanced flirtatiously at my toaster oven I would torture you for years before finally killing you when I got sick of your incessant crying. I rarely use the microwave for foood other than popcorn. I use it 3 or 4 times a day to reheat my coffee or tea though. I always use the toaster oven to reheat any and all food items. It slaughters the microwave, oven, and stovetop. I love my toaster oven!!! Yet I won't let you go. I'll damn them straight to hell! Try cooking bacon on a sheet tray in your oven. You'll never go back. I finally had a chance to try oven-baked bacon today. 16 minutes at 400 degrees. The taste was better than either pan-fried or microwave. The bacon was a lot more flavorful. I may add a minute or two though because it wasn't as crispy as I would have liked. The only hassle is remembering to turn on the oven before getting in the shower so it's at 400 when I start getting breakfast ready. The microwave in our house is not an intregal part of cooking. As a side note, I have no use for a toaster oven so it does not exist in my kitchen. CCCB wrote: The only hassle is remembering to turn on the oven before getting in the shower so it's at 400 when I start getting breakfast ready. See this thread, particularly this comment, for explanation of a successful oven method that doesn't require preheating. When we moved into our house 9 years ago the appliances were fairly new, however over the last nine years some have aged more gracefully than others. The first to officially give up the ghost was the microwave. Not surprising really, it was a GE POS wrapped in hideous white plastic. We (the wife and I) dutifully trudged out to at least 6 stores, dragging 3 miserable children with us for hours on end, and agonized over every detail for 3 or 4 weeks. All we could really decide upon was that we wanted to replace all of the appliances with high end stainless steel models (the ‘fridge is on its last leg and frankly the electric stove is the only slightly more adequate that cooking over 6 taped together BiC lighters). Turns out that stainless steel is not all created equal, some is quite white, some is a yellowish bronze and some is even a sort of patina green. I was mistakenly laboring under the illusion that slight variations in hue were of no consequence. I am truly lucky to have such a wonderful life partner in my wife to dispel these absurd notions. Now it was clear that we needed not only pick a microwave but plan the eventual replacement of all of the appliances, weighing the merits and deficiencies of each single piece so that a complete set from a single manufacturer – no a single LINE from a single manufacturer - could be coronated to reign over our 7’X7’ kitchen. Further agonizing was obviously called for. Now to be honest, while I am in fact a man anatomically, I have to admit there is only so much suffering I can bear – a weakness of character I admit. My wife however shows no such shortcoming; she can tolerate with remarkable endurance the hours upon hours required to pour over the dozens (and if necessary hundreds) of brochures and visit the countless stores required to select a microwave. It is my duty of course to be by her side for every single solitary second in this endeavor. Have I mentioned how lucky I am to have a life partner of such resolve? Except for a 2-year stint in a house that had a built-in microwave, I haven't had one for probably 14 years. I've got a lot of kitchen crap - laboratory immersion circulator, dedicated sausage stuffer, hell, I've got a Hobart meat slicer, but a microwave? Ehh.